A new board was seated last night at VashonBePrepared’s Annual Meeting. As set out in our bylaws, we have two classes of directors – ex-officio directors as set out by our bylaws – primarily the chief representatives of our partners – and those elected by the membership at our annual meeting: our at-large directors. I heard that “our” very own Don Price recently served as the head of ESF-6 for FEMA’s recovery efforts in Mississippi! He and other locals who have been serving afield will present their debrief on Tuesday, June 21st, from 1 – 3 PM. The location is the King County Office of Emergency Management Room 114 – Main Coordination Center. There have been ground breaking developments in Children’s issues, FNSS, ADA, ESF 6 multi-agency coordination and more. Lessons learned, best practices and how to apply them to our local operations will all be discussed. The King County Mass Care Workgroup is hosting the annual Mass Care Regional Forum on June 8 and you are invited! The goal of this free forum is to bring together government, non-profit, faith-based and other partners who would have a role in Mass Care (shelter, feeding, distribution of emergency supplies, etc.) for disasters in King County. Information will be provided and exchanged on planning efforts, emerging issues, resources, and channels for receiving and offering assistance during a disaster. In times of disaster, a trained and informed public is better prepared to protect themselves, their families, their workplace and their neighbors. 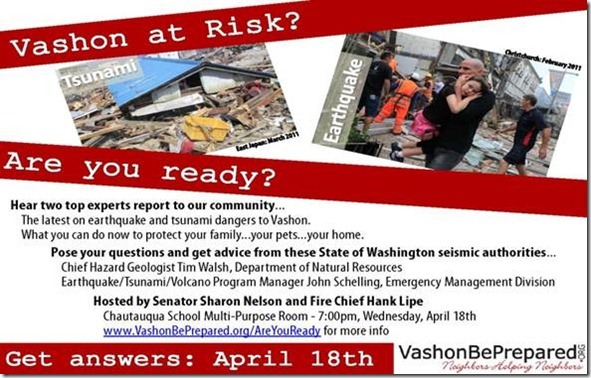 This webinar will showcase several disaster training resources that are available in communities across the nation. FEMA recognizes that it takes a “whole community” approach to meet the needs of the public before, during and after a disaster. Learn how your community can train and educate its citizens to be better prepared and involved in your community’s disaster response and recovery efforts. Washington State Emergency Management Association (WSEMA) will hold their annual conference at the Red Lion Hotel in Port Angeles, Washington on September 27-29, 2011. The theme for the 2011 conference is “Preparedness: It’s Not a Mystery”. If anyone is interested in speaking, the deadline for their call for presentations is 1 Jun: contact Cheryl Bledsoe [Cheryl.Bledsoe (at) clark.wa.gov].